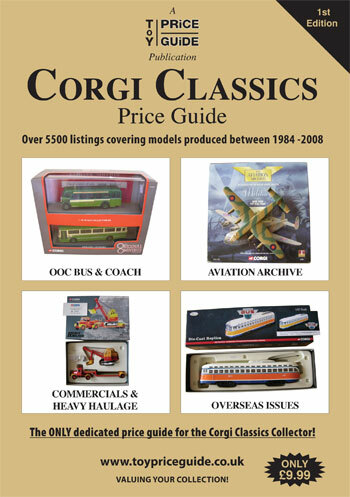 Due to numerous requests we now have available our Corgi Classics Price Guide covering models released after 1983 following Mattel’s collapse up to 2008 when Hornby purchased the company. Packed with 132 pages and 200 colour pictures this BRAND NEW publication includes over 5500 individual models each with realistic market values. The guide has been produced in association with several recognised collectors and is the ONLY dedicated and independent guide providing values for the Corgi Classic collector on the modern issues produced by the numerous owners of the company since 1983. All Prices are based on items sold through sale rooms and internet auctions during the past 12 months. We also offer discounted rates for retailers & specialist traders requesting 5 or more copies. For more information please use the CONTACT US button on our home page and we will forward details. All books are mailed on Mondays & Thursdays every week following receipt of payment.